In eCommerce terms, a product catalog is something that provides information on a product in an organized manner. It is the fundamental aspect of an online store that communicates with users and potential buyers. The structure and organization of a product catalog holds the power to convert your store visitors to customers. However, in WooCommerce community, the word catalog is used in a slightly different context. 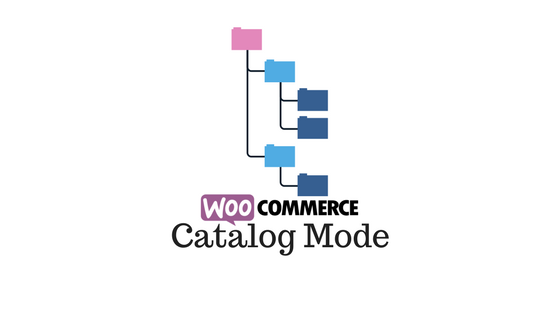 When you say WooCommerce catalog mode, it denotes just an informative resource for a set of products. This often results in a functionality where your store becomes a product information resource that necessarily don’t have buying options. In fact, there are quite a few good WooCommerce plugins that would provide selective product visibility, and these are generally called WooCommerce catalog mode plugins. This article deals with some of the best practices that you can follow while setting up a product catalog. We will also look into some of the best WooCommerce catalog mode plugins that help you organize your product line up in innovative ways. 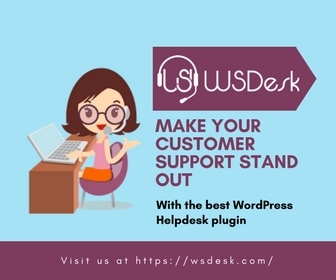 If you want to make the same store offer diverse experience for different users, WooCommerce community has several plugins to help you. Let’s take a look at some of the prominent ones. 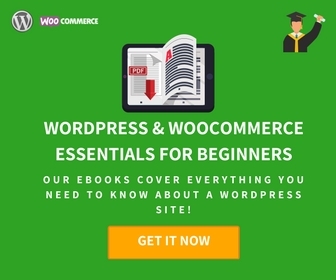 With the help of this plugin (previously XAdapter), you can transform your store into WooCommerce catalog mode, where your site acts as just an information resource for your products. You can effectively transfer the traffic on your site to other sales channels like a marketing place or a physical store. In addition, you can easily set different pricing strategies for different users. For example, if you want to offer your products at wholesale and retail rates depending on who is buying, this is the one to go for. With the help of this plugin, you can make price adjustments to specific products or the entire catalog. You can remove add to cart button, or make the prices invisible for specific users as desired. In addition, you can modify the add to cart button, with a customized text on product and shop pages. For example, “Call for price”. And, if you want to redirect customers to another site, you can add the URL to this button. Tax calculations, too, will be based on the specific user roles. WooCommerce catalog mode is also helpful when you are revising prices, updating stock, or doing site maintenance. With the help of this plugin, you can turn your entire store into catalog mode with a single click. This sort of easy transformation will make sure your customers are not left in the dark. And as discussed above, if you want to use catalog mode as a long-term customer specific store strategy, that is easy too. Now, we have seen how WooCommerce membership plugins help present exclusive content to members. Similarly, you can provide an exclusive pricing pattern to your loyal, returning customers. This has the potential to build long-term bonds with your customers. Important strata of customers are wholesale buyers. As wholesale buyers are looking to purchase in bulk, you always have the freedom to experiment with the pricing structure. This freedom can be fully utilized with this plugin, as you can completely change the product prices – not merely make adjustments. The plugin even has an intuitive capability to create a custom user role in case a visitor doesn’t fit into any existing roles in your store. You can purchase the single site subscription for the plugin at $59. If you want to actually try it out before purchase, check out the free version. However, please note the free version supports only simple products, while the premium one is for all product types. 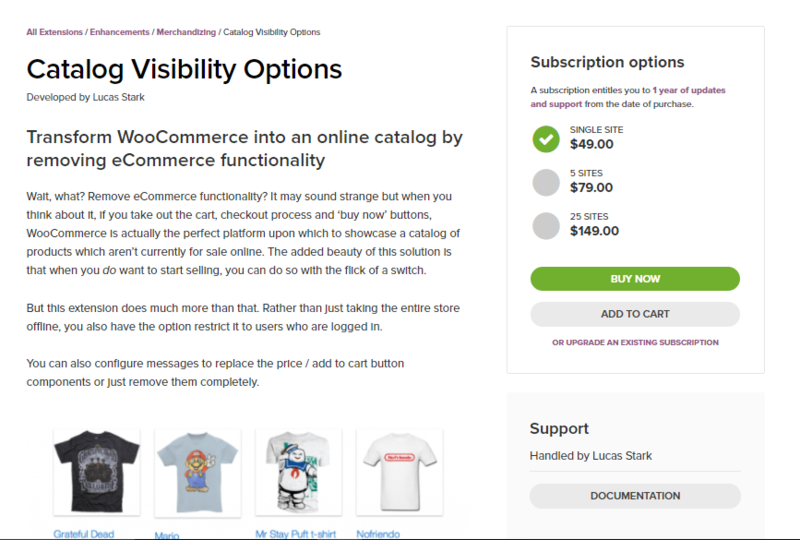 This WooCommerce extension helps you convert your store into an online catalog. Thus your site can be the perfect location to display products that are not yet on sale. And, whenever you want to convert it into an active eCommerce site, you can do so with a single click. As we have seen in the previous case, you can make the change to the whole store, or only to specific customers. Also, you can alter the visibility of price and add to cart buttons for all or specific users. And if you want to add a custom text for these elements, you can do that too. 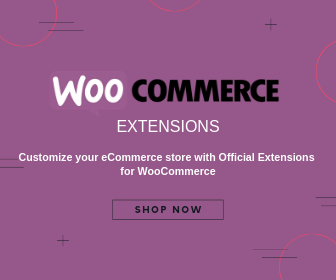 This extension can be quite handy if you wish to change your WooCommerce store into catalog mode. Basically, with this extension, you can display different prices according to user roles. Moreover, it helps you create strategies without deviating from Minimum Advertised Price (MAP) rules. The price is $49 for a single site subscription. As in the case of the other two plugins discussed here, this one too primarily helps to transform your shop into catalog mode. But this one has a few additional features packed into it. It offers custom contact forms, which you can set up with each product. Which means customers who are interested in your products might be able to access you easily. Furthermore, with an option to associate the permalink of a product with the contact form, you will instantly know which one the customer is talking about. Detailed inquiry form and location-based visibility modifications differentiate this plugin from its competitors. You can also disable the review system on your store, or selectively disable for specific users. The plugin gives you the freedom to create an exclusion list in two ways. If you want to apply catalog mode to the majority of your products, you can do so by specifying which ones to exclude. On the other hand, if you prefer to apply catalog mode only to a select few, you can use the “Reverse Exclusion List” option. You can also modify the visibility of users based on the country they are accessing from. The plugin is compatible with YITH multi-vendor and WPML, to make things easier for you. You have to pay $59 to get a single site license of this plugin. The product catalog is one of the vital aspects of a successful online store. With abundant options all around, today’s customer expects an organized and informative catalog of any product they are looking at. And you may have multiple sales channels that you are focusing on a business owner. Sometimes, to appeal to different strata of consumers, you may even need to keep the content slightly different to appeal to different sensibilities. This is all part of the immense scope of personalization you see everywhere in the eCommerce sector. And of course, product catalog too can be personalized to suit your business interests and varied customer expectations. Here are a few guidelines to help you make your product catalog informative and interesting. The product information on your store needs to be something helpful for users to make a purchase decision. It is really important to ensure that the product descriptions and images reflect a professional approach. If not, you may lose many potential customers at the earliest stage of the sales funnel. Customers land on a product page with only vague ideas of your product most of the time. A successful product page should be able to depict features and usefulness of that product in the shortest span of time. The information needs to be consistent so that the list of your products looks like a cohesive whole. For example, if you have a particular attribute, all the relevant products should use the same attribute. Thankfully, on a platform like WooCommerce, there is no scope for such inconsistencies. The global attributes feature would help you with a smooth implementation. Today’s eCommerce scenario offers great potential to store owners to sell via multiple channels. In addition to a brick and mortar store, you probably are selling the same set of products in multiple online locations. These may include marketplaces, wholesale stores and a simple store made of a platform like WooCommerce. When you ensure consistency in your product catalog on all sales channels, you are also convincing your customers with a neat, professional impression. On the other hand, the same product is represented with different information at different places, you may only manage to confuse the customer. Interestingly, there are multiple solutions to streamline a multi-channel experience for store owners. A consistent and organized product information resource would ensure seamless integration across sales channels. Moreover, if you want to migrate store information from one location to another, there are awesome tools to ensure a seamless experience. Customer experience is the watchword of today’s online sales landscape. If you are not able to provide a pleasant experience to your customers, you are only helping your competitors. Research says over 30% of online customers would not purchase from an online store if there is not adequate product information. A detailed description that includes all the possible search terms would ensure that your customers are able to search and find your products. Moreover, when there is adequate information presented to them in an organized manner, customers would feel more confident to buy from you. A good product catalog management strategy should let you expand your product base without hassles. When you already have a well-structured product catalog, adding new products to the store would be easier. For example, if you use categories and product attributes in a professional manner to organize your products, you already know the advantage. When a new product is added to your product range, you will know exactly where it’ll fit in. So, once a good structure is in place, it acts as a good foundation for all your future expansions and modifications. When you are running an online store, most of the time you are not only selling your own products. You are going to procure products from multiple suppliers and wholesale dealers. You will most probably get a very raw product data from such sources, which definitely won’t have the refinement to present to customers. However, if you already have a structured approach in product classification and representation, it won’t be so much of a task to import these. Similarly, various marketplaces will have different requirements for representing product data. For example, along with your store, you may want to place your products on Amazon Seller Central or Google Merchant Center. A decent catalog management strategy would ensure you manage all these without hiccups. When you are managing multiple sales channels at once, you may need to find one place to manage it all. This aspect is relatively simpler when you are starting out, or you only have a few products in your catalog. However, when you scale your business, things should not go completely out of hand. A platform like WooCommerce will be good enough to base your products, as there are tools to import and export products easily. However, on a large scale scenario, you may need a comprehensive store management tool like TradeGecko. eCommerce stores are getting more and more exclusive with great options available with most platforms. Exclusivity means customers are deriving more satisfaction from the shopping experience. At the same time, with targeted offerings, store owners are able to concentrate on profitability better. You can provide an exclusive pricing structure to each of the different customer segment that you are targeting. One of the prerequisites for setting up a multi-tiered dynamic pricing system is good catalog management. When you know the organizational pattern of each of your product, you are better equipped to experiment with pricing strategies. At the same time, a structured product catalog enables you to manage multiple sales channels without hassles. 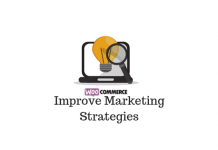 WooCommerce has efficient tools to help you manage multiple sales channels and pricing strategies. The article probably gave you a glimpse of some of the best practices in catalog management. Furthermore, we have mentioned three WooCommerce catalog mode plugins that would help you set up a great pricing plan. Let’s know if you want to share an opinion on the subject.